Our Pedal boats are our easiest boats to operate, they glide through the water even in wind and waves. They're very stable and lots of fun! Most kids over 12 can use these boats by themselves (with parental supervision, of course). Note: Minimum price of $50.00 is based on two adults maximum. Extra adults will be $25.00 per person. Capacity per boat is 4 people (children included) or 900 lbs. Weight restriction per seat is 250 lbs (113 kg) Kids 11 & under are $10.00 per hour each when accompanied by 2 adults in the same boat. 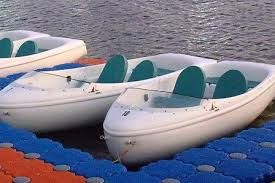 We have one pedal boat that holds 5 please contact if you would like to reserve this boat. Price is $25.00 per person per hour. Kids under 12 are $10.00 per hour when accompanied by minimum 2 adults. Boat rentals are also available on a drop-in basis from 9am to 4 pm daily, subject to availability.